Attention grown ups – be sure to get out and vote this week! And kids, use our Election Day printable worksheet to learn a little bit about the political system too. How many words can you make from Democrat? How about Republican? 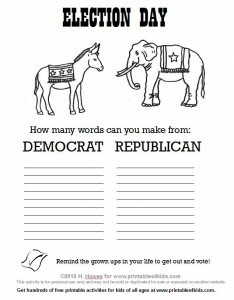 Have fun making words from the two political party names and color in their donkey and elephant mascots, too. Click on the image to view and print the Election Day Worksheet full size.